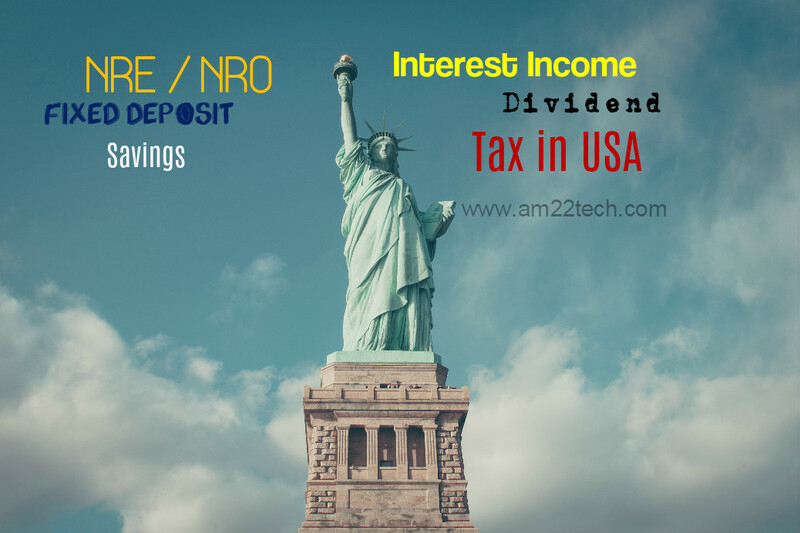 Is Interest Earned on NRE Account Taxable in US? 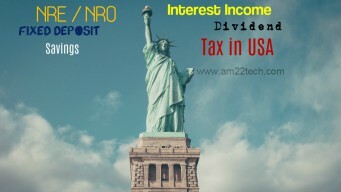 Yes, Interest earned on NRE Account or NRO Account is Taxable in U.S. including NRE FD, NRO FD interest. You have to add all your income from India to your US income and pay taxes if you are a Green Card holder, PIO, OCI or legal resident (working on H1B, L1B, H4 EAD or any other work visa in USA). The income includes the Indian mutual fund dividend too, if you have invested in SIP (systematic investment plan) in India. IRS publishes the exchange rate for all foreign countries as year-end treasury rates. Use this rate to convert Indian (or for that matter, any other country) to reach a USD amount. It is possible that current year’s rate in not published by IRS. In that case, use the xe.com rate for the Dec 31. NRE account interest income is non-taxable in India. Hence, no tax is withheld/deducted automatically by Indian banks. NRO account interest is taxable at straight 30% plus applicable surcharges and Cess. File the US income tax form 1040 with online services like TurboTax, TaxAct or H&R block. Irrespective of the tax filing service you use, you should fill up Schedule B to disclose your Indian foreign income. Find the total amount of Tax (called TDS in India) deducted by bank (by looking at bank statements). Bank would also send you Form 16. ICICI normally sends form 16 it by postal mail or email – if you have registered. On the other hand, If you really paid any income tax, in your foreign (the tax might have been applied, if you are not from India) country, you should enter the information in appropriate section. Do Indian Banks Issue form 1099-INT for Interest Income? Indian banks do not issue Form 1099 INT for interest earned in NRE account. You are responsible for disclosing the foreign interest income on the US income tax form 1040. Even US based banks do not issue 1099-INT if the total interest for the year in less than $10. How to find total interest earned in Indian Bank for the year? Almost all the banks in India pay out interest quarterly (every 3 months). You just need to pull out your each bank (e.g ICICI, SBI, HDFC, Kotak etc.) statement ending in March, June, September and December. Find the interest pay-out and add up. Count March (of preceding year) interest as well. Remember, financial year in USA is counted from 1 Jan to 31 Dec whereas in India, it is 1 April to 31 March. Do we have to pay Tax on NRO account Interest in USA? You have to pay US income tax on Indian NRO account interest income. You can claim the TDS deducted by Indian bank from your NRO account as Tax Paid to foreign government on your US tax return. I have a NRE account and I earner 12000 Inr as interest. I am going to declare that on my tax return. My account never exceeded 10000$ last year so do I have to mention about my foreign account? I don’t think foreign account declaration is needed if your account never had more than $10k. Why do we have to report NRO account and interest earned in NRO account since those assets cannot be transferred to U.S.? US tax law says that you have to declare your global income. Do we have to fill the form 1116 to receive a foreign ta credit ? The IRS instructions say that you don’t have to fill form 1116 if you received the form 1099-INT (“or substitute statements”). Can the form 16A issued by Indian banks treated as “substitute statements”? Is that recognized by IRS? I don’t think you need to fill any form to claim foreign tax credit. If you use any online tax filling software, they should be able to rake care of it. Well the online tax software (tax act) asks me whether I’m required to fill the form 1116 or not. If I’m required to fill it then they can’t help us. Then, use either Turbo tax or FreeTaxUSA as they both do not ask this question.